Check that a valid QRemote Control license code has been entered, either in the F8 Defaults screen, or against each system record. 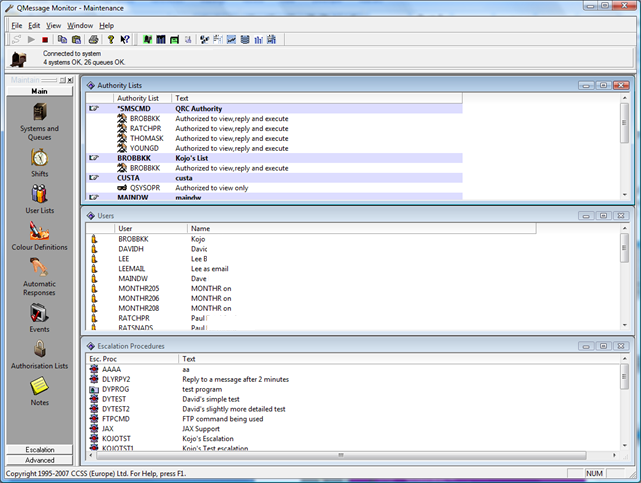 From the main QMessage Monitor Maintenance module, select “Authority Lists” and check that an *SMSCMD authority list has been created. The user *PUBLIC should be created with no authority and then individual users added as required. 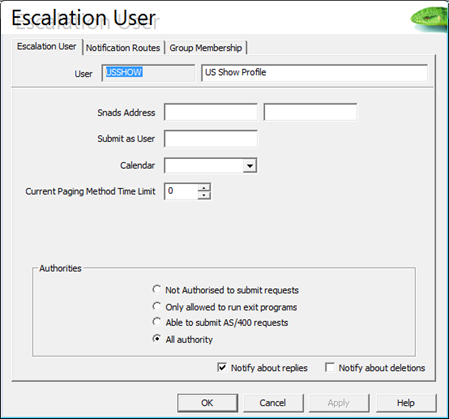 Escalation Users should be created or amended to use QRC. Support Group *QRC (the panic list) should be created, if required. This is used to notify Support staff that QRC may be experiencing problems. 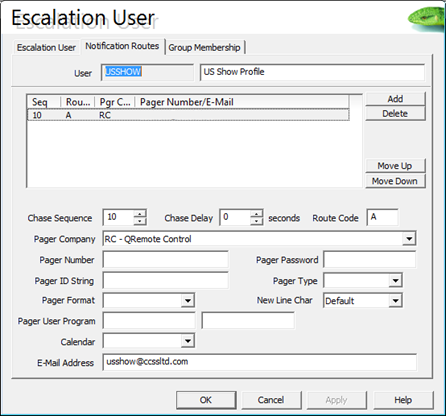 Ensure that a simple Escalation Procedure has been created to page the QRC user. 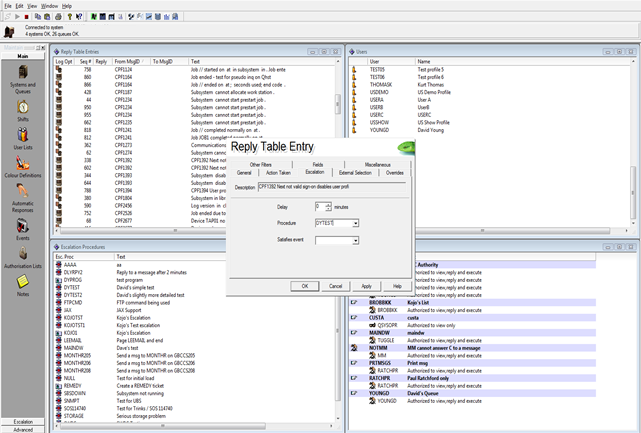 Create an Auto Reply record to use the escalation procedure. 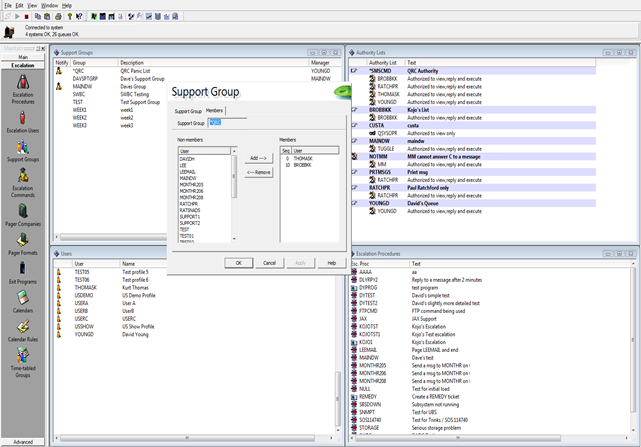 Always define a naming convention – allows for multiple servers and units to be configured. Ensure that the IBM i user ID and password given to you is valid, else use the MM profile. Remember to export the system configuration so that you can use MESSAGE.EXE for test purposes. Ensure that you know whether the SIM requires a PIN or not. Remember, that if using a SIM from a mobile phone, all messages should be cleared out and inform everyone not to use that number during the demo period. Ensure that the Service Center Address number is known beforehand or at least that you have verified the carrier. A drop-down list is available. Use the System Details to verify the firmware version, if necessary. 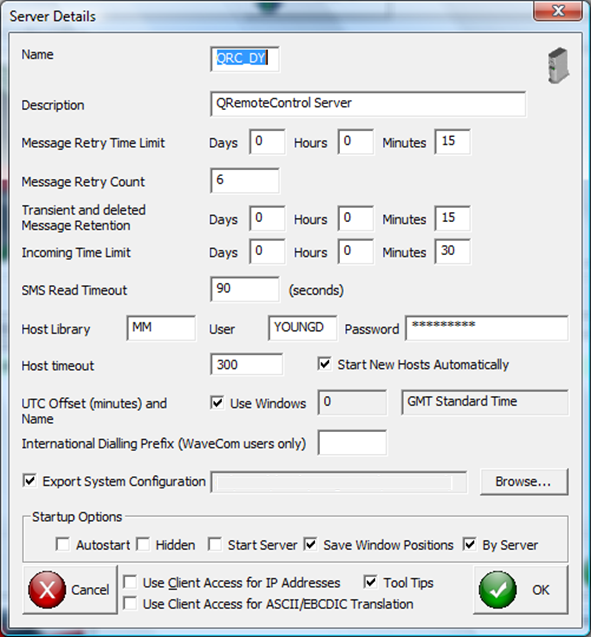 Use the IBM i host TX job to verify the IBM i QRemote Control version. 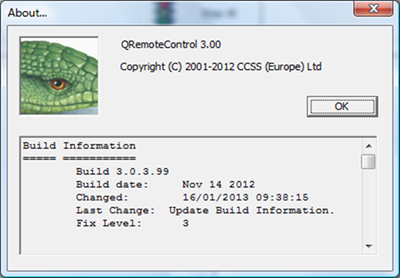 Use the HELP > ABOUT screen to verify the QRemote Control PC build information. Rx:OK Is a PIN number required? “SIM PIN” response = waiting for PIN. “SIM PUK” response = PUK code required. Rx:OK Request equipment model code. Rx:OK Request equipment’s firmware level. Rx:OK Set’s Short Message mode to PDU mode. 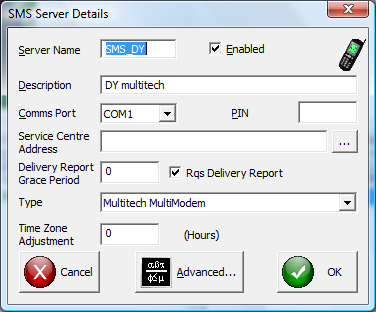 Rx:OK Registering with the SMS service centre. Rx:OK Report Mobile equipment error. Rx:OK New SMS message indications. 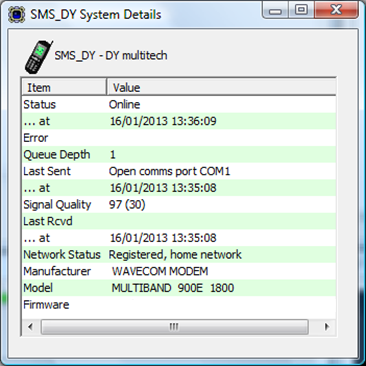 Rx:OK Registering with the GSM Network. Rx:OK What networks are available? Rx:OK Requesting signal strength data. Rx:OK List SMS messages from preferred store. If using a SIM from a mobile phone, always ensure that the inbox, outbox, and message archives have been cleared down. Also, warn people who are likely to phone them, not to use the mobile number for the duration of the demo. An incoming call will cause the unit to generate a communications error. Never insert or remove a SIM while the unit is powered on. Always ensure that phone numbers are entered in the international format, +NNnnnnnn where NN=the country code, without spaces. This applies to escalation users as well as the Service Centre Address. As the Flight Recorders are encrypted, a copy of DecoderRing will be required, if you wish to review the recorder for first level support purposes. AT guides are available on a CD supplied with the hardware, if required. 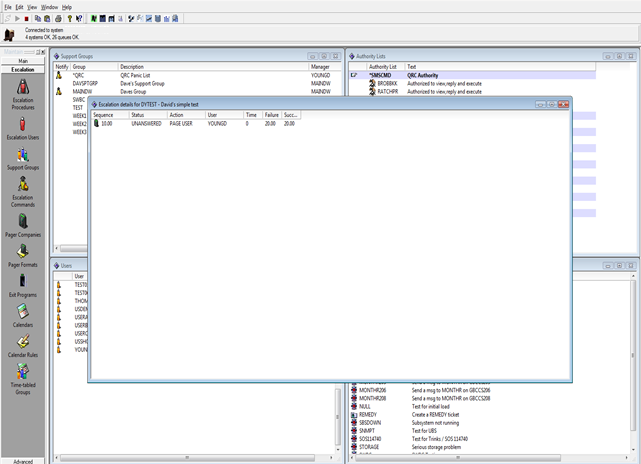 If you receive a Frame Error message when configuring the SMS Server, amend the BAUD Rate to a higher value (best advice is to amend it to the maximum value and then work backwards to find the optimum setting).